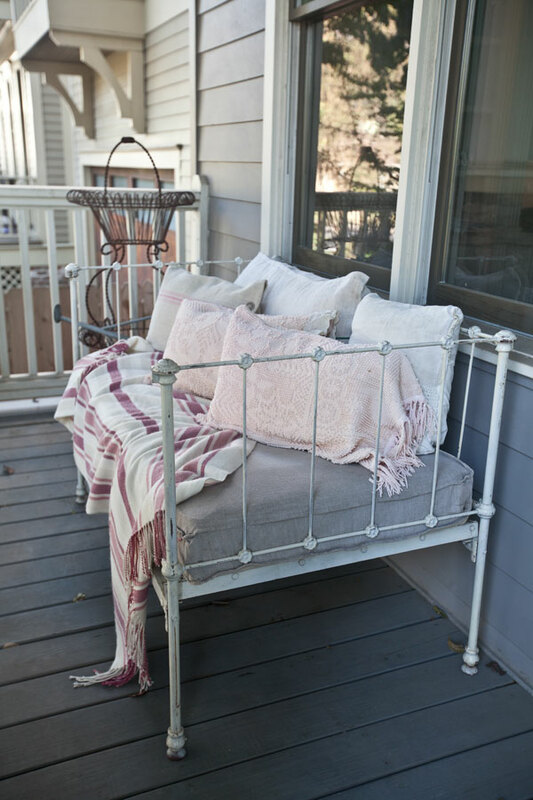 Yes I love a bed on my porch. 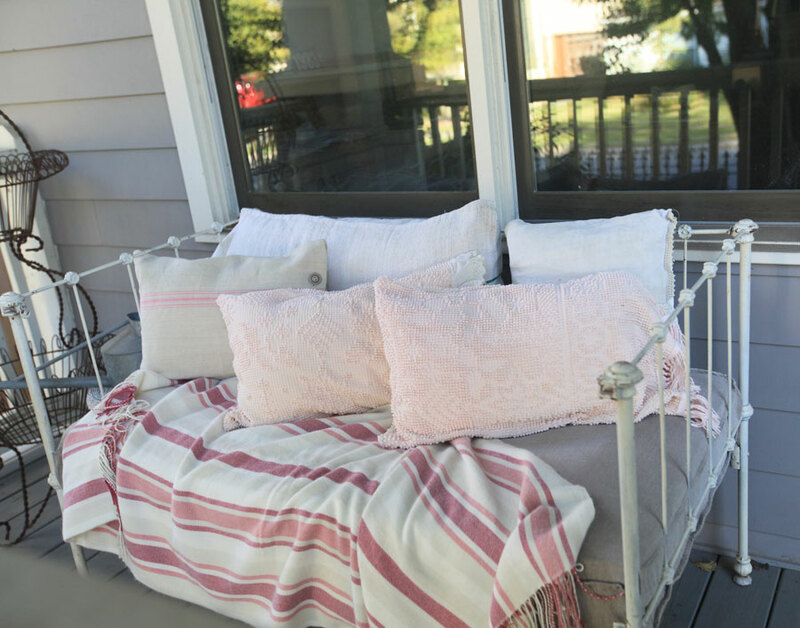 In fact at the farm, we’ve got a daybed on the back porch. SEE MORE HERE. So it should come as no surprise that I love using a crib as a bench. I bought a crib awhile back and began to use it as a settee. I liked it, but wanted a different look. 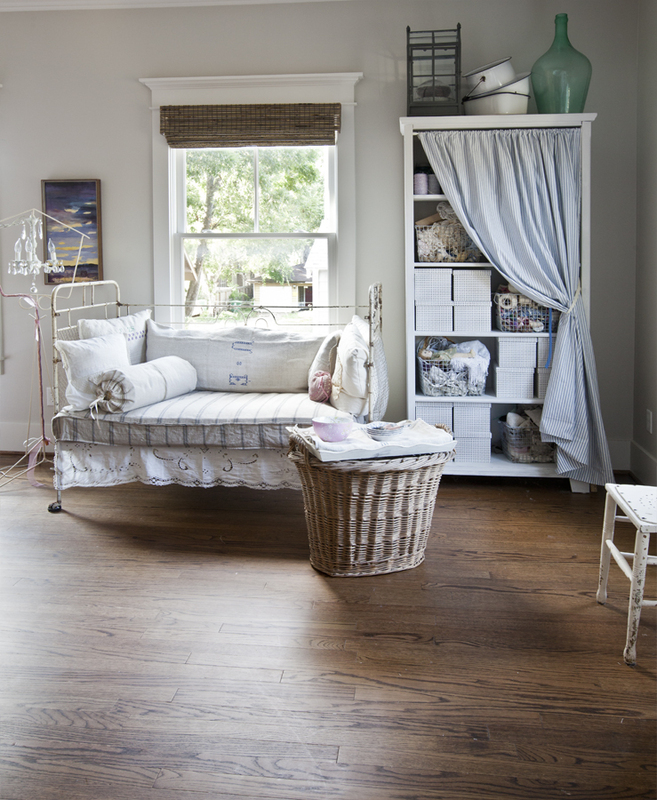 So I sold the crib shown below at my booth at Round Top for about what I paid for it. The lady who bought it was a photographer and was going to use this piece during photo shoots. I love that! So I felt this crib went to a good home. You can read more about this crib HERE. Then I began a search for a replacement piece. I found exactly what I was looking for at Marburger this fall. It was a stunning French daybed that was listed for about $2,000. I decided to pass for now. That’s a big chunk of change. But I did find something I really loved on Craigslist a few weeks later. This crib below was just the ticket at $100. That was about half the price of the previous crib and I like it a lot more. Both are antiques. Craiglist is scary to a lot of people, but honestly I’ve only met people that at least on the surface appear to be quite normal. They apparently didn’t trust me though, because they had the crib out in the driveway when I came, so I didn’t have to go into their house. Ha! Seriously if you are buying from or selling to someone you don’t know, it is best to do the transaction outside if possible. So all kidding aside, I was happy they had the crib outside. This is our front porch in the city. You can see just how close the neighbor is. So how did I convert the crib to a bench? Well actually I didn’t do anything extra. I just removed the front part of the crib, which is easily removable. The springs under the mattress do have a lot of give in them, so it’s almost like sitting in a hammock. If you don’t like that, you can always put a board under the mattress to support it more firmly. That’s what I did with the first crib. The cushion is simply a standard crib mattress I bought at Walmart. These antique metal cribs are usually disassembled very easily, so they are not a big deal to take apart or put together. 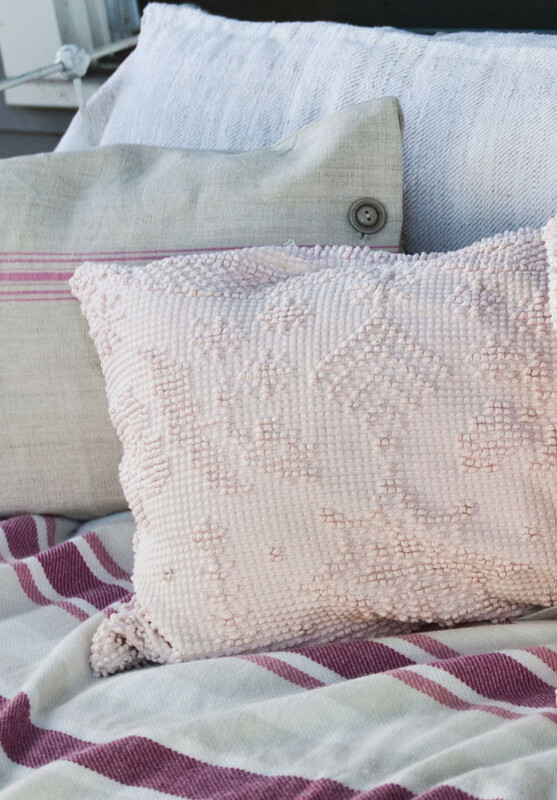 And I think the crib turned bench is so cozy with these pillows made from a vintage pink chenille bedspread. If you want one, they are available in my shop, but hurry, I only have a few left. Love, love your crib bench and everything that is on it…..and around it! I love this. I so wish a had a significant covered porch to create something like this. Our covered area is so shallow that when it rains everything still gets wet. I love all the cozy touches you added to the space. My grandmother had a chenille bedspread like that. When I would stay with her as a child I would “pet” it because it was always so soft and cozy. 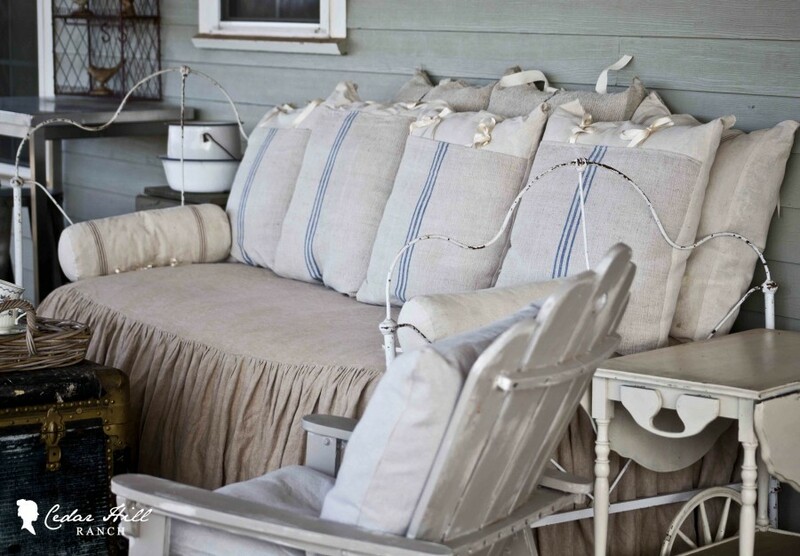 I love your bench and chenille pillows, it must be a great place to sit and relax when you can. Thanks Anita for all the information and have a wonderful Thanksgiving with your family. please pass on an extra hug from me to her and one for yourself too ! Keep strong and praying daily. HI ANITA I AM SORRY TO HEAR ABOUT YOUR MOM AND MY THOUGHTS AND PRAYERS ARE WITH YOU…. Thank you so much Shirl! !